Astronauts aboard the International Space Station have bid farewell to Orbital ATK’s Cygnus OA-6 spacecraft, the Rick Husband. Unberthing and separation operations began around 09:30 EDT (13:30 UTC) on Tuesday, after which Cygnus began its new role as a test vehicle for future spacecraft safety systems. The OA-6 mission’s success for Orbital ATK followed quickly from the company’s Return To Flight in December 2015, with the OA-4 mission. That OA-4 mission saw the debut of the Enhanced Cygnus, as well as the spacecraft’s first flight aboard United Launch Alliance’s Atlas V rocket. OA-6 also launched atop an Atlas V rocket on 22 March 2016 and marked the second flight of the Enhanced Cygnus – which flies with lightweight, high-performance solar arrays and more cargo space than its predecessor. Despite a Booster under-performance issue on the Atlas V during first stage flight, the rocket’s veteran Centaur upper stage successfully delivered the OA-6 Cygnus to its initial orbit. The Rick Husband then conducted a multi-day approach to the ISS before rendezvousing with the Station on 26 March. 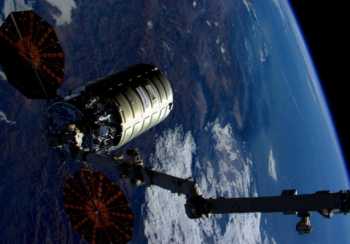 Since then, Cygnus has spent 80 days attached to the Space Station, 20 days more than the 60 on-ISS-day requirement provided for in the contracts between Orbital ATK and NASA. During this time, astronauts have unloaded 3,513 kg (7,745 lb) of supplies and reloaded the Rick Husband with no-longer-needed equipment, parts, and day-to-day living essentials that have been resupplied by other visiting vehicles. Now at the end of its mission, astronauts aboard the ISS unberthed the OA-6 Cygnus from Node-1 nadir and set the craft free for the next phase of its mission. After being cleared by ISS management for unberthing, the Station’s crew depressurized the vestibule between Cygnus and ISS before releasing the 16 bolts that secured the craft to the Space Station. The 16 bolts were released – driven – in two stages, physically disconnecting Cygnus from the main structure of the ISS while the SSRMS held the spacecraft firmly in its grasp. Once the bolts were released, astronauts Tim Peake and Tim Kopra carefully translated Cygnus 10 meters away from the Station and eased it through a series of maneuvers to bring the Rick Husband into the release position. Once Cygnus was in position and the “go” was given, Peake and Kopra drove – released – the snares inside the Latching End Effector (LEE) on the end of the SSRMS to let go of Cygnus, allowing it to fly under its own systems. 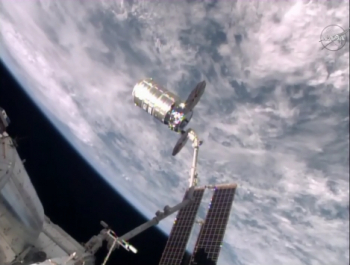 Release occurred around 09:30 EDT (13:30 UTC), with Kopra thanking the Cygnus teams as the vehicle began its departure. Peake and Kopra, from their viewing position in the Cupola’s Robotic Work Station, then slowly moved the SSRMS away from Cygnus – while the spacecraft maintained a constant ability to rapidly, but safely, perform abort maneuvers. With the SSRMS moved to a safe distance, ISS controllers in MCC-Houston and Orbital ATK controllers at MCC-Dulles conducted a series of system checks prior to Cygnus’ opening departure burns. Cygnus then took itself out of the Keep Out Sphere (KOS), before eventually departing the Approach Ellipsoid, marking the point where joint operations between NASA and Orbital ATK ended. Unlike previous Cygnus missions which have initiated destructive reentry procedures shortly after departing the vicinity of the ISS, OA-6 was the first Cygnus to conduct a second critical mission for NASA following unberth. This first post-unberth activity involved the Spacecraft Fire Experiment, or Saffire-I experiment, which will see Cygnus controllers deliberately ignite a fire inside a specially-designed 3x3x5 foot tall module mounted inside Cygnus’ pressurized cargo volume. The inside of this special experiment module contains material samples commonly found on the ISS and the Orion spacecraft. 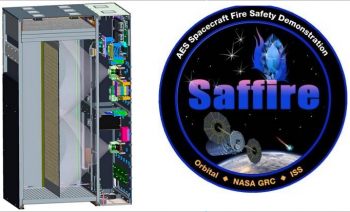 Saffire-I, according to NASA, provides a new way to study a realistic fire aboard a spacecraft. But the uncrewed and end-of-mission destructive nature of Cygnus flights now provides NASA a real, safe, in-flight test bed for understanding how a fire works, spreads, and dies in microgravity while exposed to the various materials a spacecraft is built from. For Saffire-I, a suite of instruments will measure the flame growth and oxygen consumption of an intentionally set fire. 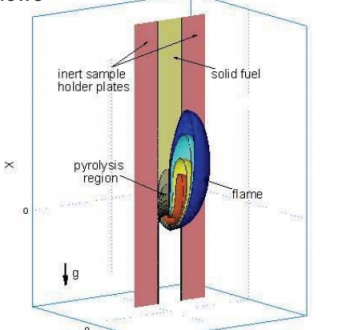 According to NASA, the results of this and at least two planned follow-on Saffire experiments on the OA-5 and OA-7 Cygnus crafts could determine microgravity flammability limits for several spacecraft materials, help to validate NASA’s material selection criteria, and help scientists understand how microgravity and limited oxygen affect flame size. “NASA’s objective is to reduce the risk of long-duration exploration missions, and a spacecraft fire is one of the biggest concerns for NASA and the international space exploration community,” said Jason Crusan, NASA’s Advanced Exploration Systems director. 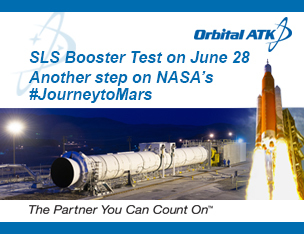 That test went well, according to NASA Glenn later on Tuesday. Following this single-day Saffire-I experiment, if all goes well, Cygnus will then deploy five LEMUR CubeSats for NASA from an external deployer on Wednesday, 15 June. 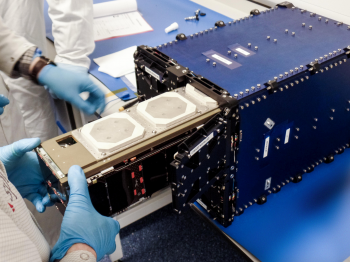 The LEMUR CubeSats are part of a remote sensing satellite constellation providing global ship tracking and weather monitoring. Following LEMUR CubeSat deployment, Cygnus will remain in orbit for an additional week as MCC-Dulles controllers perform various in-flight tests on Cygnus and its systems to better understand vehicle performance in orbit for future adjustments to the craft’s design. After eight days of post-departure operations, controllers will command the OA-6 Cygnus through a series of two deorbit burns on 22 June. 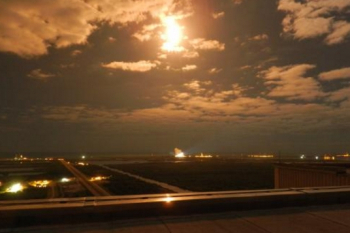 These burns will take the spacecraft into a destructive re-entry over the Pacific Ocean. 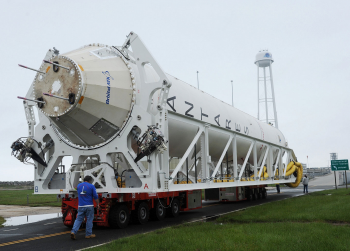 Following completion of the OA-6 mission, Orbital ATK plans to follow next month, at the earliest, with the OA-5 Cygnus mission – which will see the company return Cygnus launch operations to its Antares rocket. Launch of the OA-5 Cygnus, recently named the Alan Poindexter after the late Space Shuttle Pilot and Commander, is currently planned for 6 July 2016 at 16:49 UTC from launch pad OA at the Mid-Atlantic Regional Spaceport in Virginia.